Luke Skywalker is every bit the podracer his father Anakin was... which is why Darth Vader must sabotage him. The dark lord of the Sith and main villain of the Star Wars movies may claim to be fueled by the Dark Side of The Force, but the comic books have shown that jealousy, and a desire to remain the best human podracer on Tatooine (or any other world) is just as important. Besides adding another crossover between Luke and Vader long before the truth of their bond was confirmed - back when Luke was simply the Rebel pilot who blew up the Death Star - the comic story should please fans old and new. Sure, there may not be a truly massive fan base for Anakin Skywalker's younger self seen in Episode I - The Phantom Menace... but thanks to Darth Vader's spectating and sabotage of Luke's own try at podracing... that chapter of his life just became a LOT easier to swallow. The story, for those who wish to enjoy it in all its envious and petty glory for themselves, comes in the pages of Star Wars Annual #4. When Vader and Luke end up on the same world for two different missions, an unexpected skirmish leaves them both scrambling to regain the upper hand. For Luke, that means escaping Imperial Stormtroopers by making a daring decision. To again remind readers, the comic - like the rest of the main Star Wars books from Marvel Comics - takes place after A New Hope, and before The Empire Strikes Back. 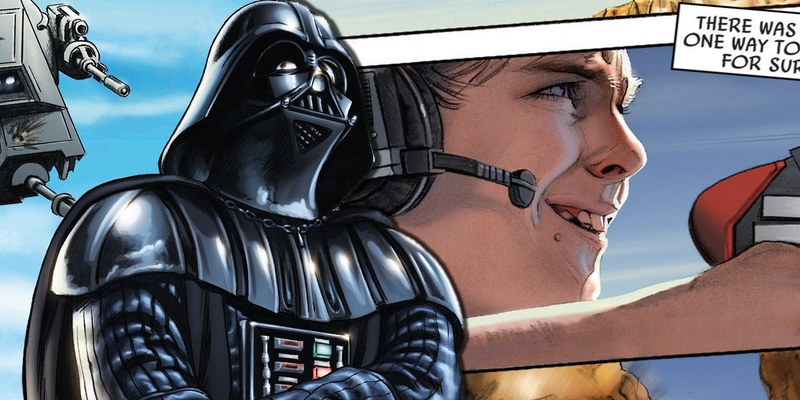 So despite any possible suspicions, Vader does not yet know that the talented new Rebel pilot is actually the son of Anakin Skywalker (still presumed dead). That will all change in Empire, when Emperor Palpatine famously informs Vader of the boy's obvious parentage. But for the time being, Vader is simply watching an unknown human enter the podrace already arranged on the planet Hradreek. The lack of human beings seen in the podrace of Phantom Menace could have been chalked up to them being a minority in the populace. But this Annual reinforces the idea that humans are a rare entrant in the sport. Whether that's due to discrimination or a lack of prehensile limbs to manage the controls isn't clear. What is clear is that Vader, despite being decades away from his own time on the circuit, notes that Luke's skills behind the controls are most "Impressive." As it turns out, a little too impressive for Vader's ego. The moment is subtle enough for some fans to miss entirely, with only a flex of his hand to indicate that Vader is having any effect on the race. But the sudden eruption of Luke's podracer engine (unknown even to those calling the race) is a clear sign of Vader's influence. He may not know it just yet, but Vader's son is just as willing to get caught up in a test of piloting, bravery, and risk-taking as his son. And while Luke may not realize it, his father is just as unwilling to be bested in a cockpit as he is himself. Sure, Vader's reaction may be due to the apparent Force-fueled possession or evil aura contained in the lightsaber of Darth Atrius, the new Sith introduced in this same comic story. Seeing Luke tempted by anger and violence when holding the lightsaber is proof of its power, and Vader is in possession of its mate when sabotaging the podrace. But let's be honest: does that make this new, canonical encounter between Luke Skywalker and his former podracer father any less fantastic? Not a chance.